Costa Rican international forward Joel Campbell signed for Arsenal in August of 2011, before being loaned out to clubs in France, Spain and Greece while never being given the chance to truly prove what he could do at the Emirates despite a staring performance for his country during the last World Cup in Brazil. Now however with both Theo Walcott and Alex ¬Oxlade-Chamberlain joining the list of the Arsenal injured the 23-year-old is being given the chance to show what he can do against Swansea this afternoon, with Gunners boss Arsene Wenger hoping that it will have all been worth the wait. “I have been very impressed with him, his attitude is outstanding,” Wenger said. “He can be a big help for us. In the coming two to three months he can be very important. “I didn’t want to send him out on loan again. I wanted to keep him here. He has been on loan two or three times and that it is now or never for him with us. 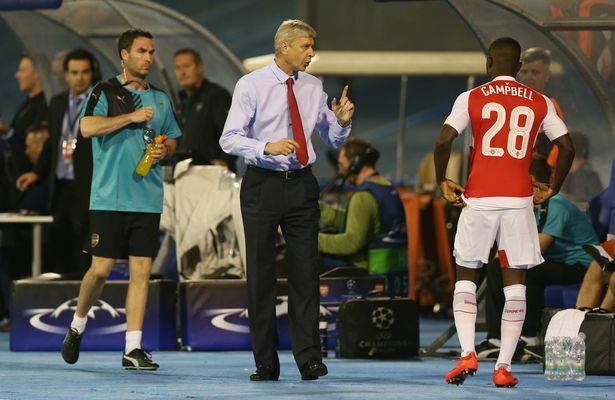 Wenger stressed Campbell can play centre-forward but he is likely to operate down the right flank on Saturday. “That is where he prefers to play,” said the Frenchman. Oxlade-Chamberlain will be out for “20 days” according to Wenger, with Walcott absent “a bit longer”, probably until December. Both suffered muscle injuries in the Capital One Cup defeat at Sheffield Wednesday.